September 12, 1939 About 160 prints of scenes of Brooklyn and Long Island in the period of 1870 to 1880 taken from negatives made by George B. Brainard will be shown at the Brooklyn Museum from September 22 to October 8. The exhibited prints will be selected from the more than 2000 negatives that are a possession of the Museum. This showing will be coincident with and related to the Convention of the Photographic Society of America which will be held in New York from October 1st to 8th. Herman de Wetter, A. R.P.S., Photographer for the Brooklyn Museum and Chairman of the Museum Committee for the Convention is arranging the exhibition. Brainard was an indefatigable photographer, as is evidenced by the large collection of negatives now owned by the Museum, He was also meticulous about labelling each negative so that its scene and subject are unmistakable today. His field of operations, according to the collection, was Long Island, the Connecticut shore and the Hudson Valleys Manhattan scenes will be included in an exhibition to be held in Manhattan, The exhibition at the Brooklyn Museum will show what a mine of pictorial records is available to the press and the interested public and will show a great many startling contrasts between the 70’s and now, in the center of Brooklyn, for instance. Curiously enough this collection was sent to the Museum twenty years ago when an old residence was emptied-arid for years the negatives were stored in the basement, Only recently it was decided by the Photographic Department to investigate the acquisition with the result that a remarkable wealth of interesting and amusing records has been discovered. Brooklyn Museum Archives. Records of the Department of Public Information. Press releases, 1939 - 1941. 07-09/1939, 203. 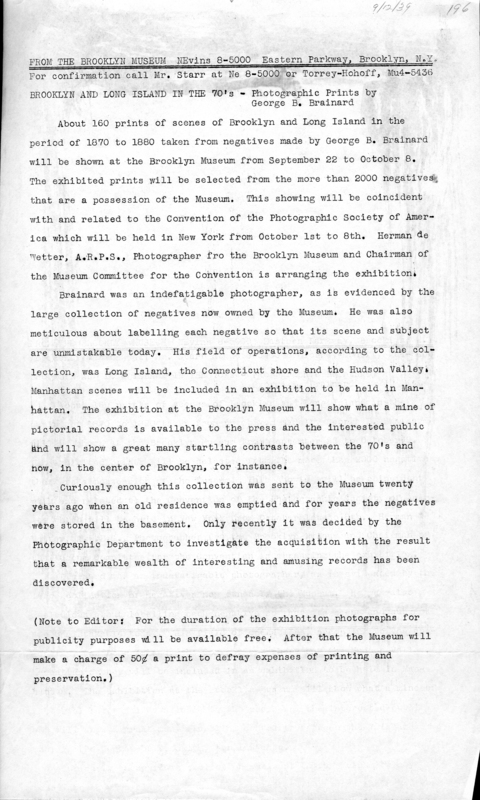 September 16, 1939 Ten exhibitions are already on the Brooklyn Museum’s exhibition schedule for the 1939-1940 season. As an opener, in order to be current with the style news, an exhibition of a more or less preliminary character opened on Saturday, September 9th, called Style Foundations--Corsets and Fashions of Yesterday and Today, to run through October 1st. The first exhibition of the season opens on Friday, September 22nd, and will be called “Long Island in the 70’s". It will be a showing of some 160 prints of Brooklyn and Long Island scenes taken from a collection of over 2000 negatives of scenes in Long Island, Connecticut, New Jersey and the Hudson Valley, taken by George B. Brainard and acquired by the Museum twenty years ago. Only recently these negatives were brought to light by the Photographic Department. 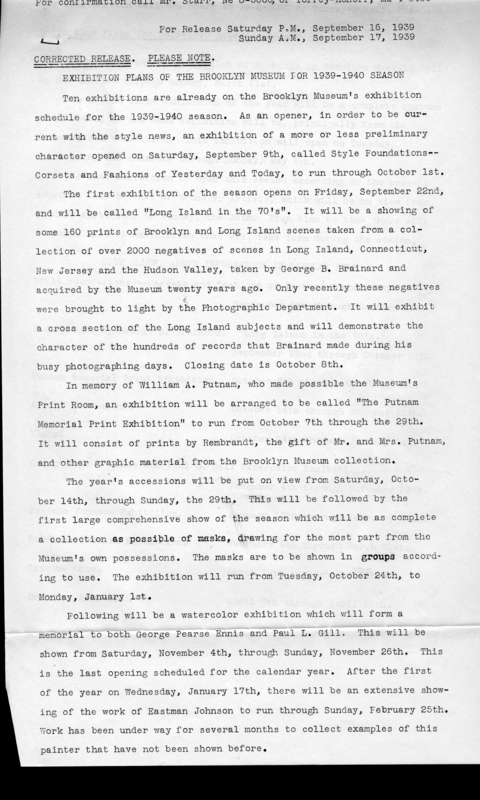 It will exhibit a cross section of the Long Island subjects and will demonstrate the character of the hundreds of records that Brainard made during his busy photographing days. Closing date is October 8th. In memory of William A. Putnam, who made possible the Museum’s Print Room, an exhibition will be arranged to be called “The Putnam Memorial Print Exhibition” to run from October 7th through the 29th. It will consist of prints by Rembrandt, the gift of Mr. and Mrs. Putnam, and other graphic material from the Brooklyn Museum collection. The year’s accessions will be put on view from Saturday, October 14th, through Sunday, the 29th.1 This will be followed by the first large comprehensive show of the season which will be as complete a collection as possible of masks, drawing for the most part from the Museum’s own possessions. The masks are to be shown in groups according to use. The exhibition will run from Tuesday, October 24th, to Monday, January 1st. Following will be a watercolor exhibition which will form a memorial to both George Pearse Ennis and Paul L. Gill. This will be shown from Saturday, November 4th, through Sunday, November 26th. This is the last opening scheduled for the calendar year. After the first of the year on Wednesday, January 17th, there will be an extensive showing of the work of Eastman Johnson to run through Sunday, February 25th. Work has been under way for several months to collect examples of this painter that have not been shown before. On February 9th an exhibition of etchings by Rodolphe Bresdin will be put on view through Sunday, March 31st. The second large exhibition of the year will be a complete costume show, drawn, as the mask exhibition will be, principally from the Museum’s own collection. This exhibition will open on Tuesday, March 12th, and continue through Sunday, May 5th. The last exhibition to open this season according to the present schedule will be that of Brooklyn Artists, which will be on view from Friday, April 5th, to Sunday, the 28th. From time to time there will be small special exhibitions that will take form during the season. Style Foundations---Corsets and Fashions of Yesterday and Today. September 9th through October 1st. Photographs by George B. Brainard. “Long Island in the 70s.” September 22nd through October 8th. Putnam Memorial Print Exhibition. October 7th through October 29th. Recent Accessions. October 14th through October 29th. Masks,	October 24th through January 1st. George Pearse Ennis and Paul L. Gill Watercolor Exhibition. November 4th through November 26th. Eastman Johnson Exhibition. January 17th through February 25th. Rodolphe Bresdin Exhibition. February 9th through March 31st. Costume Show. March 12th through May 5th. Brooklyn Artists. April 5th through April 28th. Brooklyn Museum Archives. Records of the Department of Public Information. Press releases, 1939 - 1941. 07-09/1939, 204-5. 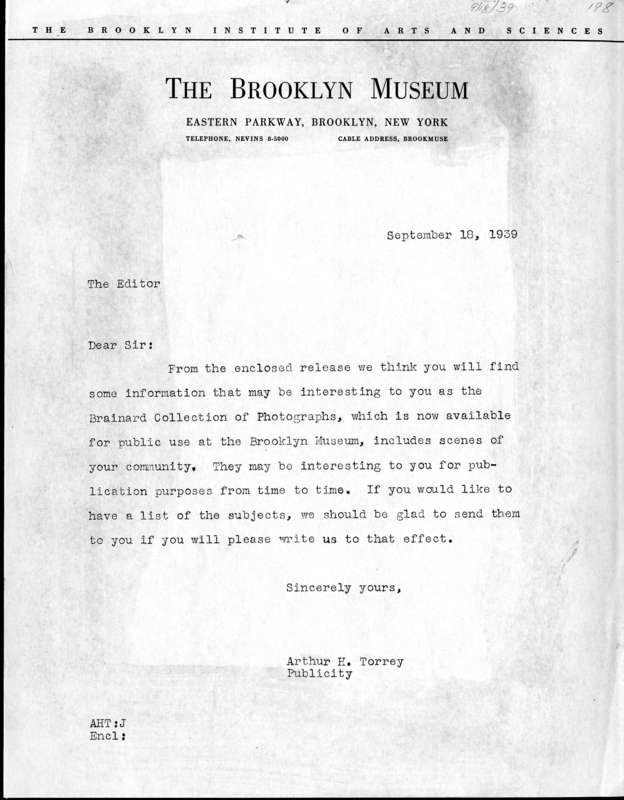 From the enclosed release we think you will find some information that may be interesting to you as the Brainard Collection of Photographs, which is now available for public use at the Brooklyn Museum, includes scenes of your community. They may be interesting to you for publication purposes from time to time. If you would like to have a list of the subjects, we should be glad to send them to you if you will please write us to that effect. Brooklyn Museum Archives. Records of the Department of Public Information. Press releases, 1939 - 1941. 07-09/1939, 206. September 22, 1939 George Bradford Brainard 4th child of Diodate Brainerd and Rebecca Bradford, Haddam Neck, Conn.
George Bradford Brainerd graduated at the Polytecnic Institute of Troy, New York in 1865, as Civil Engineer. He held the position of Deputy Purveyor in the Brooklyn Water Works for 17 years. In early life he developed a taste for the study of the Natural Sciences and also for Photography and the Languages. 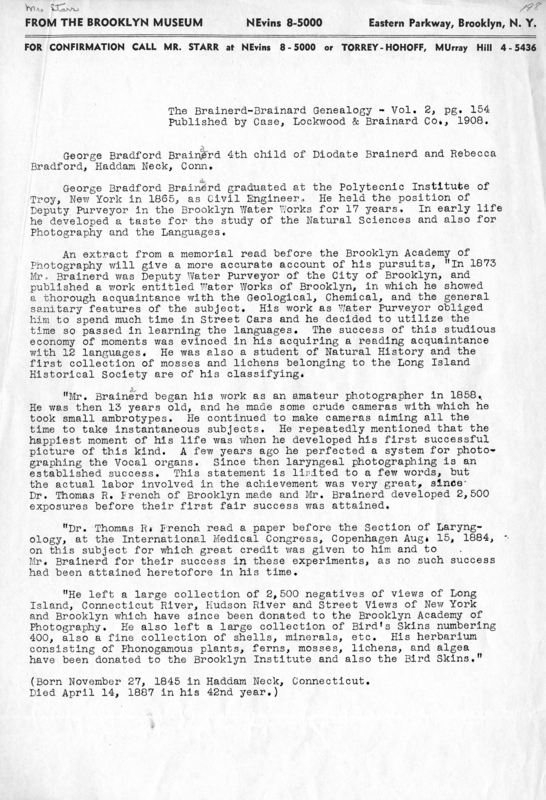 An extract from a memorial read before the Brooklyn Academy of Photography will give a more accurate account of his pursuits, “In 1873 Mr. Brainerd was Deputy Water Purveyor of the City of Brooklyn, and published a work entitled Water Works of Brooklyn, in which he showed a thorough acquaintance with the Geological, Chemical, and the general sanitary features of the subject. His work as Water Purveyor obliged him to spend much time in Street Cars and he decided to utilize the time so passed in learning the languages. The success of this studious economy of moments was evinced in his acquiring a reading acquaintance with 12 languages. He was also a student of Natural History and the first collection of mosses and lichens belonging to the Long Island Historical Society are of his classifying. “Mr. Brainerd began his work as an amateur photographer in 1858. He was then 13 years old, and he made some crude cameras with which he took small ambrotypes. He continued to make cameras aiming all the time to take instantaneous subjects. He repeatedly mentioned that the happiest moment of his life was when he developed his first successful picture of this kind. A few years ago he perfected a system for photographing the Vocal organs. Since then laryngeal photographing is an established success. This statement is limited to a few words, but the actual labor involved in the achievement was very great, since Dr. Thomas H. French of Brooklyn made and Mr. Brainerd developed 2,500 exposures before their first fair success was attained. “Dr. Thomas R. French read a paper before the Section of Laryngology, at the International Medical Congress, Copenhagen Aug. 15, 1884, on this subject for which great credit was given to him and to Mr. Brainerd for their success in these experiments, as no such success had been attained heretofore in his time. Brooklyn Museum Archives. Records of the Department of Public Information. Press releases, 1939 - 1941. 07-09/1939, 207. September 22, 1939 Old photographic scenes of Brooklyn with special emphasis on Flatbush, Bay Ridge and Coney Island as they looked between 1870 and 1889 will go on view today at the Brooklyn Museum. The exhibition will consist of a selection of 134 prints from several hundred negatives taken from a collection of over 2000 negatives that belong to the Museum and are known as the George B. Brainard Collection. The exhibition will last from Friday, September 22nd, through Sunday, October 8th. Negatives from which these prints were selected were turned over to the Museum some twenty years ago when a house on Gates Avenue was emptied. For years they rested in the Museum’s basement and only recently the Photographic Department was able to investigate the property. 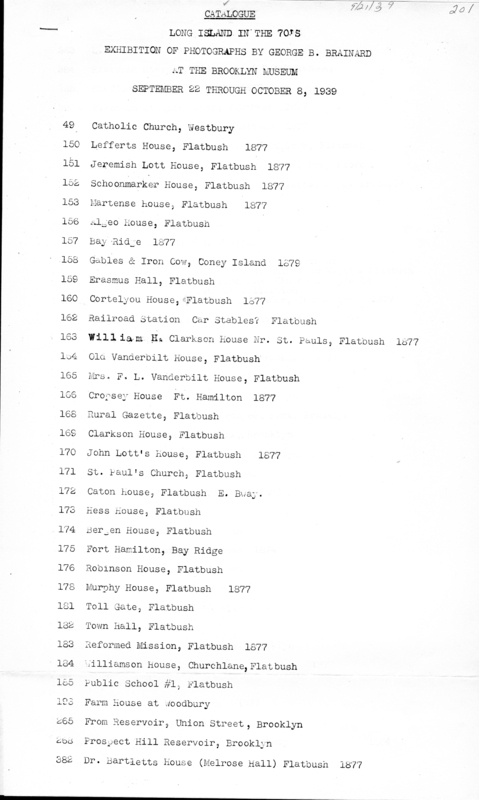 The result was the discovery of a mine of amusing and interesting records of 67 communities on Long Island including Brooklyn; Manhattan; the Bronx; Troy, New York; Fort Lee, Highland, Sandy Hook and Weehawken, New Jersey; and Newport, Rhode Island. For the benefit of Brooklyn residents this Brooklyn showing has been confined almost entirely to local scenes. Other communities will be represented in another photographic exhibition in Manhattan, as this introduction of the Brainard Collection is coincident with and related to the Convention of the Photographic Society of America which will be held in New York from October 1st to October 8th. 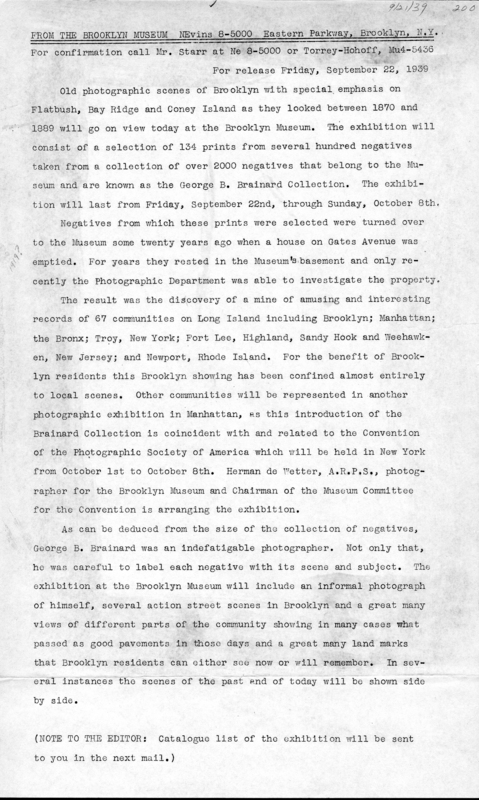 Herman de Wetter, A.R.P.S., photographer for the Brooklyn Museum and Chairman of the Museum Committee for the Convention is arranging the exhibition. As can be deduced from the size of the collection of negatives, George B. Brainard was an indefatigable photographer. Not only that, he was careful to label each negative with its scene and subject. The exhibition at the Brooklyn Museum will include an informal photograph of himself, several action street scenes in Brooklyn and a great many views of different parts of the community showing in many cases what passed as good pavements in those days and a great many land marks that Brooklyn residents can either see now or will remember. In several instances the scenes of the past and of today will be shown side by side. Brooklyn Museum Archives. Records of the Department of Public Information. Press releases, 1939 - 1941. 07-09/1939, 209. 1606	Bridge From Train, Brooklyn, N. Y. 1614	Bridge Pier (Brooklyn) ? Brooklyn Museum Archives. Records of the Department of Public Information. Press releases, 1939 - 1941. 07-09/1939, 210-3. 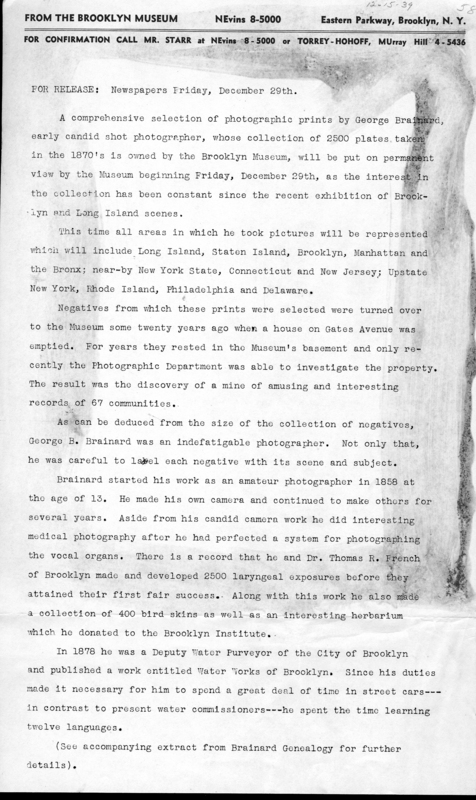 December 29, 1939 A comprehensive selection of photographic prints by George Brainard early candid shot photographer, whose collection of 2500 plates taken in the 1870’s is owned by the Brooklyn Museum, will be put on permanent view by the Museum beginning Friday, December 29th, as the interest in the collection has been constant since the recent exhibition of Brooklyn and Long Island scenes. This time all areas in which he took pictures will be represented which will include Long Island, Staten Island, Brooklyn, Manhattan and the Bronx; near-by New York State, Connecticut and New Jersey; Upstate New York, Rhode Island, Philadelphia and Delaware. Negatives from which these prints were selected were turned over to the Museum some twenty years ago when a house on Gates Avenue was emptied. For years they rested in the Museum’s basement and only recently the Photographic Department was able to investigate the property. The result was the discovery of a mine of amusing and interesting records of 67 communities. As can be deduced from the size of the collection of negatives, George B. Brainard was an indefatigable photographer. Not only that, he was careful to label each negative with its scene and subject. Brainard started his work as an amateur photographer in 1858 at the age of 13. He made his own camera and continued to make others for several years. Aside from his candid camera work he did interesting medical photography after he had perfected a system for photographing the vocal organs. There is a record that he and Dr. Thomas H. of Brooklyn made and developed 2500 laryngeal exposures before attained their first fair success. Along with this work he also a collection of 400 bird skins as well as an interesting herbarium which he donated to the Brooklyn Institute. In 1878 he was a Deputy Water Purveyor of the City of Brooklyn and published a work entitled Water Works of Brooklyn. Since his duties made it necessary for him to spend a great deal of time in street cars---in contrast to present water commissioners---he spent the time learning twelve languages. (See accompanying extract from Brainard Genealogy for further details). Published by Case, Lockwood & Brainard Co., 1908. George Bradford Brainerd 4th child of Diodate Brainerd and Rebecca Haddam Neck, Conn.
George Bradford Brainerd graduated at the Polytecnic Institute of New York in 1865, as Civil Engineer. He held the position of Deputy Purveyor in the Brooklyn Water Works for 17 years. In early life developed a taste for the study of the Natural Sciences and also for Photography and the Languages. An extract from a memorial read before the Brooklyn Academy of Photography will give a more accurate account of his pursuits, “In 1873. Mr. Brainerd was Deputy Water Purveyor of the City of Brooklyn, and published a work entitled Water Works of Brooklyn, in which he showed a thorough acquaintance with the Geological, Chemical, and the general sanitary features of the subject. His work as Water Purveyor obliged him to spend much time in Street Cars and he decided to utilize the time so passed in learning the languages. The success of this studious economy of moments was evinced in his acquiring a reading acquaintance with 12 languages. He was also a student of Natural History and the first collection of mosses and lichens belonging to the Long Island Historical Society are of his classifying. “Mr. Brainerd began his work as an amateur photographer in 1858. He was then 13 years old, and he made some crude cameras with which he took small ambrotypes. He continued to make cameras aiming all the time to take instantaneous subjects. He repeatedly mentioned that the happiest moment of his life was when he developed his first successful picture of this kind. A few years ago he perfected a system for photographing the Vocal organs. Since then laryngeal photographing is an established success. This statement is limited to a few words, but the actual labor involved in the achievement was very great, since Dr. Thomas R. French of Brooklyn made and Mr. Brainerd developed 2,500 exposures before their first fair success was attained. “Dr. Thomas H. French read a paper before the Section of Laryngology, at the International Medical Congress, Copenhagen Aug. 15, 1884, on this subject for which great credit was given to him and to Mr. Brainerd for their success in these experiments, as no such success had been attained heretofore in his time. (Born November 27, 1845 in Haddam Neck, Connecticut. Brooklyn Museum Archives. Records of the Department of Public Information. Press releases, 1939 - 1941. 11-12/1939, 322-3. 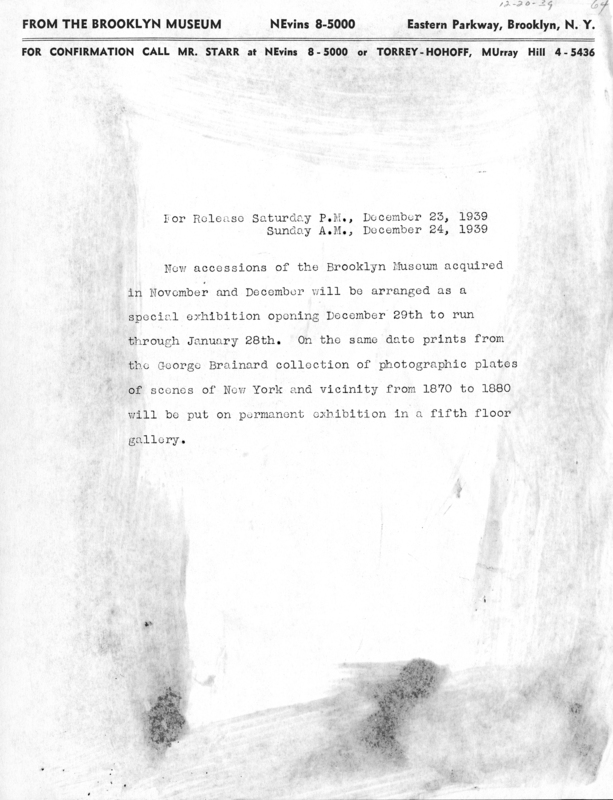 December 23, 1939 New accessions of the Brooklyn Museum acquired in November and December will be arranged as a special exhibition opening December 29th to run through January 28th. On the same date prints from the George Brainard collection of photographic plates of scenes of New York and vicinity from 1870 to 1880 will be put on permanent exhibition in a fifth floor gallery. Brooklyn Museum Archives. Records of the Department of Public Information. Press releases, 1939 - 1941. 11-12/1939, 329.